We’re settled in on the ship and feeling very blessed and watching ourselves get fatter by the day. I’ll do this entry in two installments. One regarding our shipboard experience, and then another to tell you about the AMAZEBALLS with a side of AWESOMESAUCE day we had in Cabo St Lucas. The Happy Hobbits have been cruising every year sine our first cruise through Egypt and the Greek Isles for my 30th Birthday in 2008. We were very surprised to find that we loved the experience, with the only down side being our demographic was not strongly represented on cruises, especially the longer ones that we tend to choose as they have the most interesting itineraries. To mitigate the risk of getting bored and lonely, as you never know who you will run into on the ship, we have started bringing friends and family with us to share the load of child wrangling and to enjoy the experience and share it with people we care about. This works pretty good as far as we are concerned! 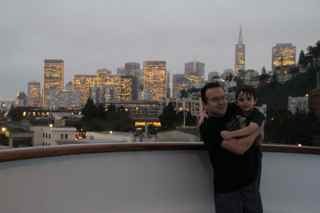 Last cruise we went through Alaska, then several Asian countries and had the whole family (kids, my parents, Grumpy’s Mom – who is also quite grumpy, but absolutely lovely as well if you were wondering – and also Grumpy Hubby’s sister and her husband). This worked out better than we could have ever hoped, as my sister in law and her husband are the same age as my parents, and the four of them really enjoyed spending time together and have become very good friends after sharing such a great experience together. It was also a nice chance to really get to know them better as they live in Hastings, so with our combined busy schedules, we don’t see them as often in NZ as we would like. This time we’ve got our dear friends who currently live in Queensland, and their daughter (my God-Daughter) and our son (his God-Daughter) are almost exactly the same age. When they are not eye gouging or squealing at each other (as two year olds are prone to do) they have a wonderful time together! It has been a particularly nice surprise to see how well my daughter S (who is six) and O (who is 2) get along. They are two little blonde princesses who love to hang out, and it is very heart warming to witness. We have absolutely decided that this is the last cruise we will ever do with Princess with a child/children who are under the age of 3. My understanding was that there is kids club from 2 years of age onwards. My understanding was wrong. And it is not a case of paying extra for childcare, they simply will not supervise any child under the age of three. Pisses me off. We’ve found a couple of nice teenage girls who take turns watching the kids for $5.00 an hour though, and we’ve been taking turns hanging out with the kids and giving each other a break, so not a complete disaster I suppose. We’ve made a few friends among the staff and crew. The DJ is a truly decent bloke, and he’s been cruising forever, so it is nice to be getting to know him. As usual, I am morally torn about the whole cruise industry. Historically, the ships dumped unimaginable amounts of rubbish straight into the oceans, when there were limited or even no regulations on this sort of behaviour. The staff and crew (particularly those from the developing world) work horrendous hours, and in many cases leave a young family behind and sail off on 9 month contracts, to enable their children to attend private schools and have the opportunities they hope for them as parents. It is heart breaking. Whenever I talk to people about it (which is daily, you know me and my chatty nature) it pulls at my heart strings. Yesterday, I had one of the cleaners; Iggy from the Philippines, tell me that he may work hard and miss his family, but life just isn’t fair, and he feels like lots of people have it much worse than him. Nice guy is Iggy. 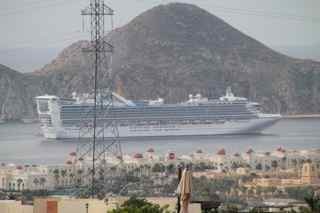 Also, the sheer volumes of food, fuel and resources consumed on a cruise liner would make your head swim. And all of this, for the rest and relaxation “needs” of the wealthiest percentile of the planet, who in many cases, already have a skewed and revolting take on their own importance and their entitlements while taking up space on this planet. It is fun, it is relaxing, we unpack ONCE and get taken leisurely to amazing destinations around the globe. And oh my WORD do they FEED YOU! At any rate, we feel very lucky to be here. The weather is getting hotter as we near the equator, and we are all enjoying ourselves a great deal. Tune in later for a peek into some of the fun we had in Cabo!